Yoga Paddies are ideal for exercises and stretching like yoga & pilates. Who can use Yoga Paddies? Anyone who wants extra support on the knees, hands, wrists & elbows. They are great for those with previous injuries of the previously mentioned areas. As they provide that extra support so you focus on your practice instead of the pain. The grip bottom will also provide the non-slip traction so you always feel safe during difficult poses. Why do you need Yoga Paddies? ▪ Perfect for Yoga, Pilates & all other exercises for a pain free experience. ▪ Focus on perfecting your practice instead of the pain & discomfort. ▪ Great for those suffering from carpel tunnel, previous joint surgeries, pronated arches, previous injuries, hypermobility syndrome, flat feet, osteoarthritis, overweight, weak joints, arthritis, & to protect and prevent injuries and wear of the joints. ▪ FREE STORAGE REVERSIBLE POUCH so you can take anywhere! Their design allows them to suction together for storage so you never keep them apart! ▪ Easy clean up with soap & water or a mat sanitizer of your choice. PAIN FREE CUSHION FOR YOGA AND PILATES EXERCISE. The mat's thick, durable cushion will protect your joints and you will have a pain free experience. Use as a head rest during Savasana and Sirsasana, allows you to perform at your peak. Great workout in tandem with your yoga mat. Ideal for Yoga, Pilates, stretching, meditation, gardening and any exercise or activity. OFFERS KNEELING SUPPORT TO AVOID OR ALEVIATE JOINT INJURIES. Yoga pad support and pain relief for hands, knees, head, elbows, feet and hips. Especially good for sore joints, chronic pain, or injury recovery. Fun&Life Yoga Knee Pad is just thick enough to provide the right amount of cushion and padding and has the perfect balance of softness so that you can avoid injury by losing balance. 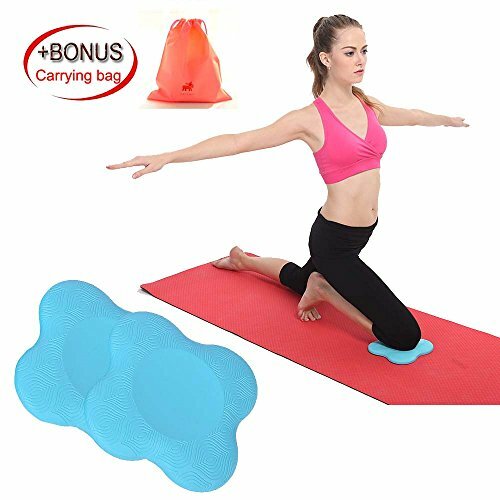 ERGONOMIC SHAPE DESIGNED BY PROFESSIONAL SPORTS TRAINERS The high quality yoga knee pad provides comfort while maintaining balance and stability. Eco-friendly, odorless and safe for your body, mind and spirit. The Yoga Knee Pad with the no-slip beautifully designed ridges offers you the grip and confidence to conquer those difficult yoga poses. It's centered concave shape makes it perfect for your knee so you don't need to continually move to adjust your position. LIGHTWEIGHT AND PORTABLE, MADE FROM ECO-FRIENDLY PU GEL FOAM with the extra 20mm thick, high density padding, will not absorb moisture and you will experience exceptional resilience. You will feel optimum grip on the pad's non slip surface. The yoga pad offers a Heat-Resistant and easy to clean durable surface.7.6" long on the sides, makes it extremely portable and perfect for travel. FREE CARRYING BAG & FREE SHIPPING 3 to 5 WORKING DAY YOU CAN GET IT! If you are not 100% satisfied with your Yoga Knee Pad, we will replace your mat free of charge or give you your money back. RISK-FREE 90 DAYS 100% MONEY BACK GUARANTEE. Customer satisfaction is our No1 priority. If you have any questions about this product by Fun&Life, contact us by completing and submitting the form below. If you are looking for a specif part number, please include it with your message.